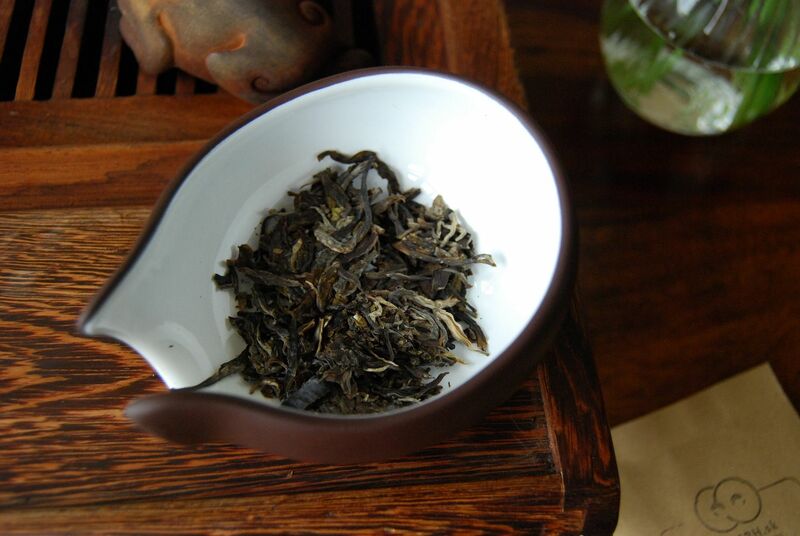 Unusual indeed is the 2010 "Purple Yiwu" from Yunnan Sourcing, which I cannot find available any more. 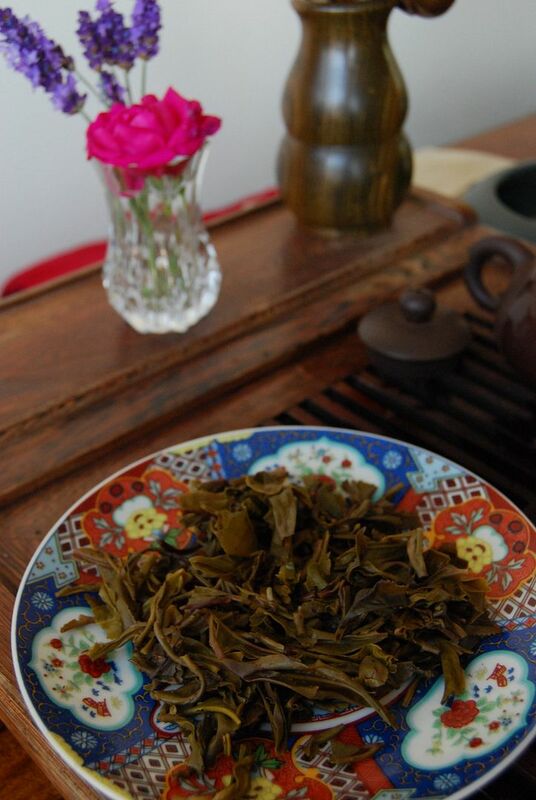 My previous flings with purple-leaf pu'ercha include the charming 2005 Dehong "Purple Leaf" brick - although not from Yiwushan - which is remade most years by Yunnan Sourcing. Back in the day, these few cakes used to be the core of the Yunnan Sourcing own-brand offerings, which have since expanded dramatically. Just visiting the web-site, I now realise that I did not try any of the YS 2012 cakes, and there are zillions of them. 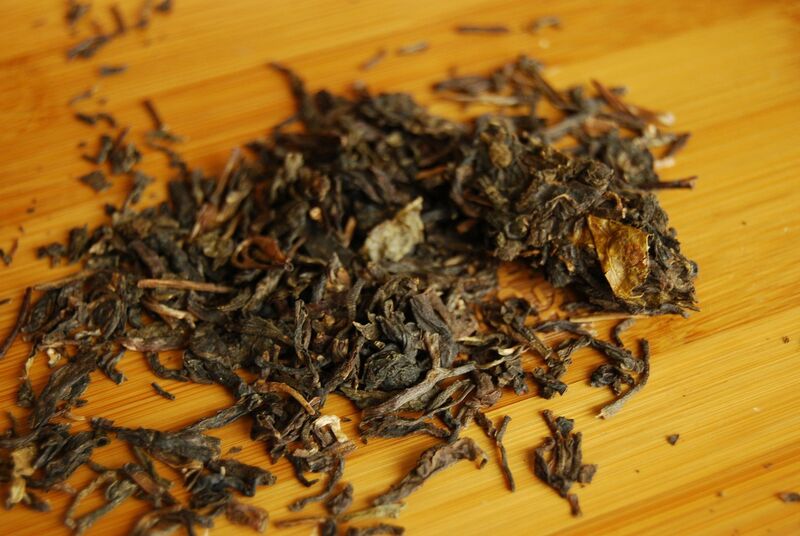 The large, well-compressed chunk of leaves has the low, sweet aroma of excellent tobacco. 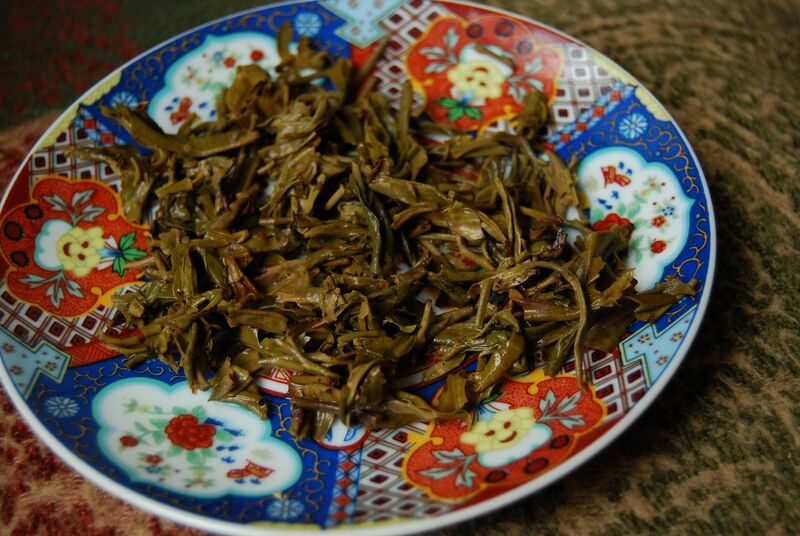 The maocha is also noticeably purple, which, it has been said, occurs through direct exposure of the growing leaves to the bright Yunnan sunshine. 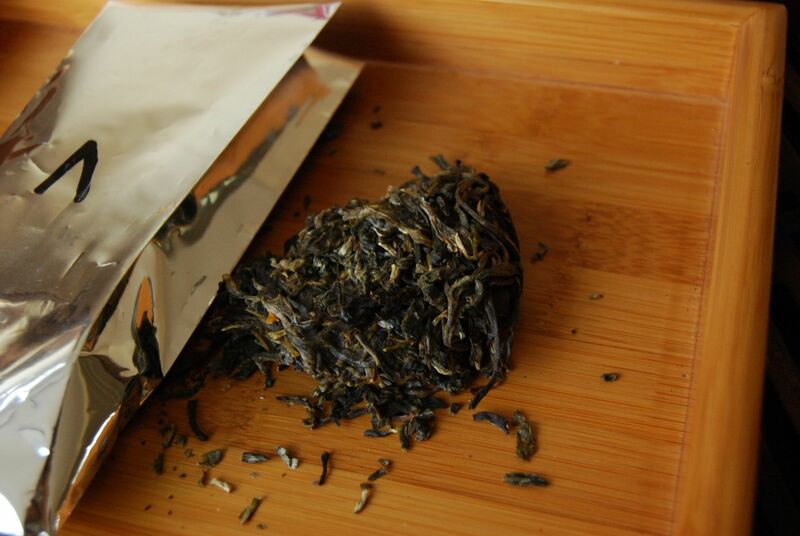 It is a good deal more like ordinary Yiwushan tea than I expected, although the finishing sweetness is extreme, and more like that expected from purple leaves. The difficulty with such things is the aging potential, but they are delicious for immediate consumption. Thanks to JT of the T blog for the sample. Hurry up and move to Oxford, man! 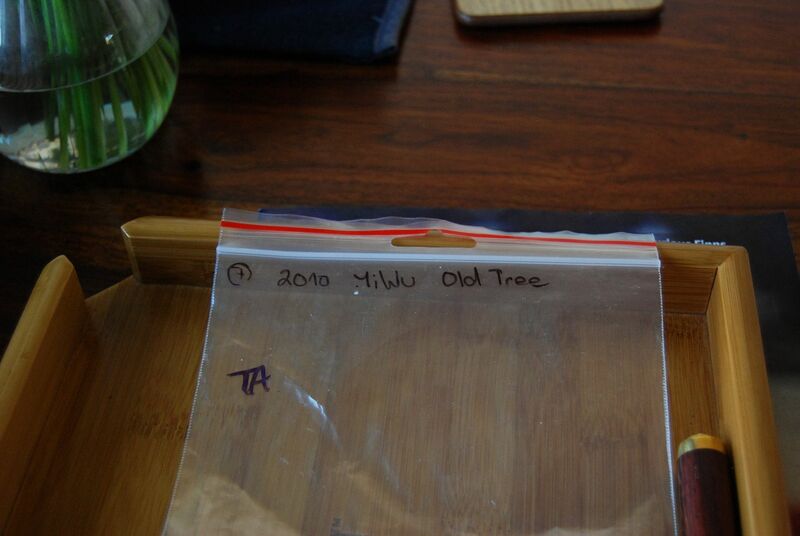 This cake, a "2010 Yiwu Old Tree", was made by the mentor of the gentleman behind the "Longfeng" Czech tea business, and was kindly provided by TA. The scent of the dry leaves is entirely dazzling, which is quite a surprise. The soup is a clean yellow-orange and has a similar clean sweetness in the mouth. It is cooling and eternally sweet in the mouth, and I begin to wonder who the anonymous mentor in question might be. A pleasant sharpness arrives at the end, just to keep things interesting. 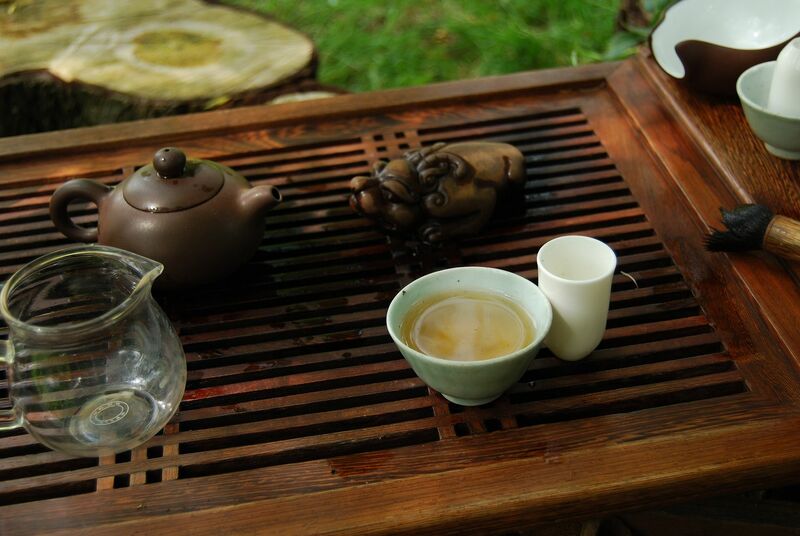 Xiaohu helps me brew, and puts the leaves into the pot after "cleaning" it with each of my chadao utensils in turn. My mother, who is visiting, asks why I have so much tea. "I need a lot of tea because I intend to drink it with my two sons." 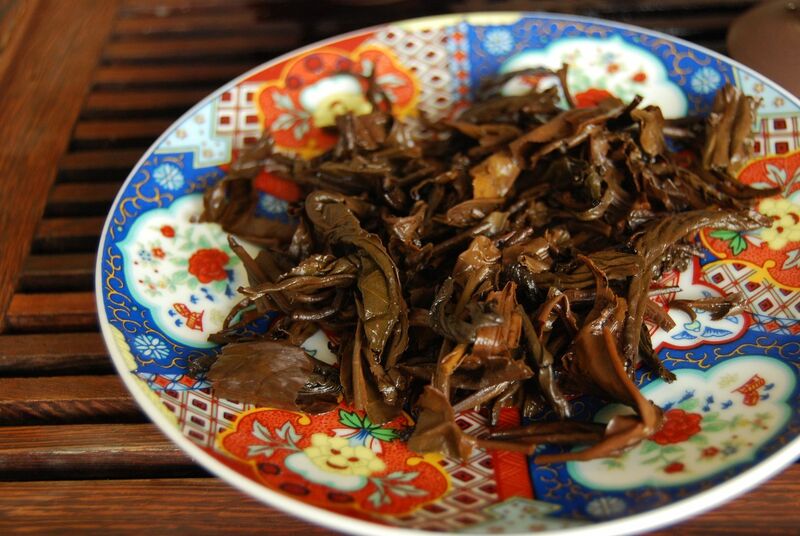 This Yiwu must surely be gushu as claimed, given its strength, purity, solidity, and penetrating qualities. It is more in every sense. 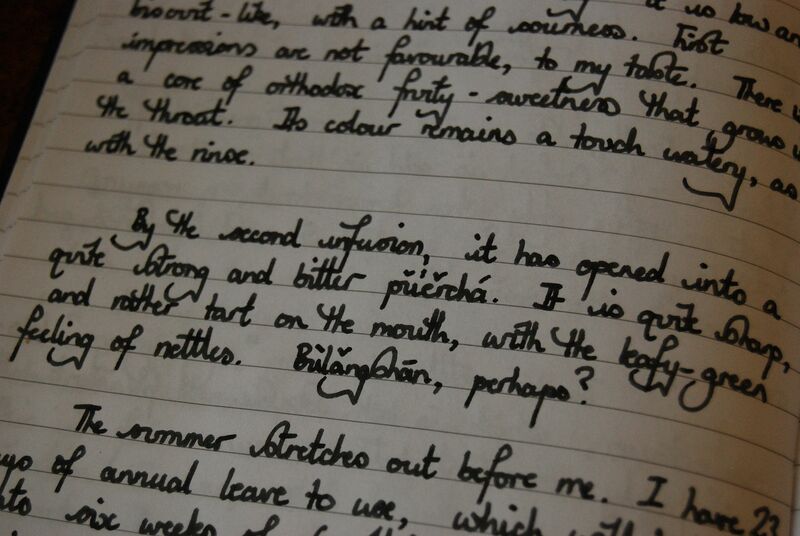 It remains undiminished as the infusions pass, and there is no sign of roughness. Heaven knows what or where this tea is available, if it is, but I loved it. 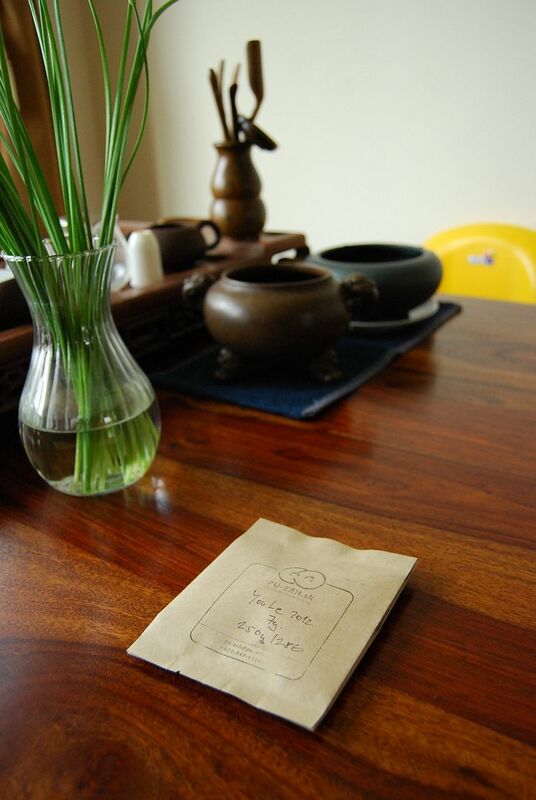 Somebody set us up the first four Yunnan Sourcing samples. Scott has been plying us with samples, for are we not souls most pliable? My ply is particularly pliable when it comes to super-fresh cakes from outfits with proven track records, such as The Sourcing. Today, the first four samples in Greek ordering (excluding the late addition of the "beta", kindly added at the last moment by Scott). I took all of these samples "blinded", and then Scott subsequently revealed the identities of each, afterwards. 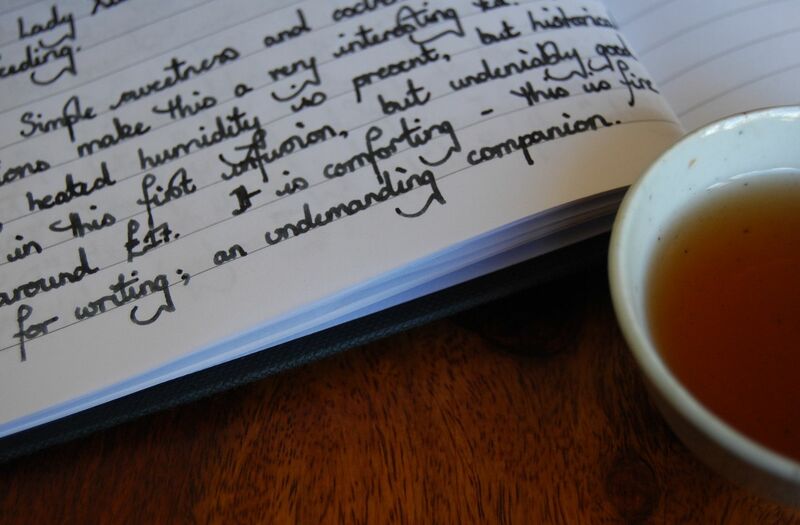 I sometimes like to force myself to try teas blind, because it strips away the thick layer of prejudice that otherwise introduces sclerotic-like sessions. If the teas are from a wide range of locations, this can be most instructive. Let's start at the top, with a tea that has rapidly become known as "theetsy weetsy", a.k.a. the "theta" sample. This sample looks and smells like Yiwu tea to me. It is super-orthodox in its grape-like fruitiness, that piles out of the sample packet and threatens to overwhelm my unprepared schnozzle. 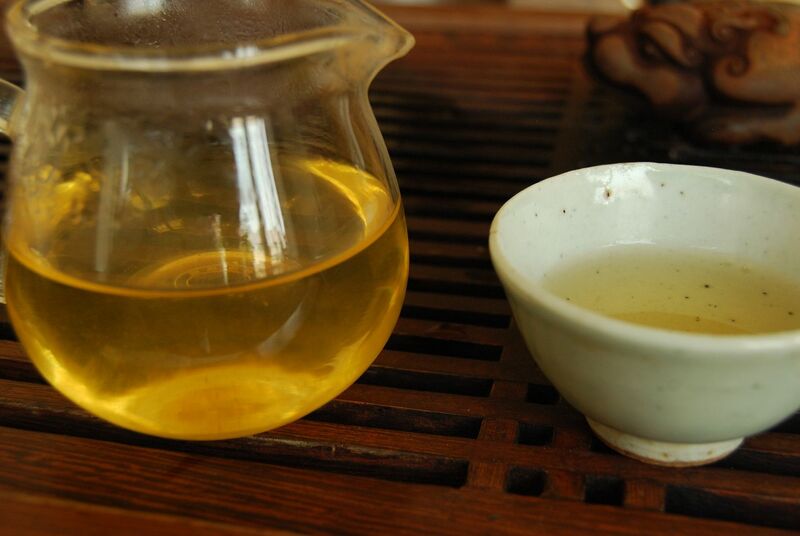 There are fewer tips, and more huangpian [yellow flakes, usually discarded before pressing] than a lot of Yiwu cakes. As with many of Scott's cake, it separates well into its constituent leaves (pictured above). 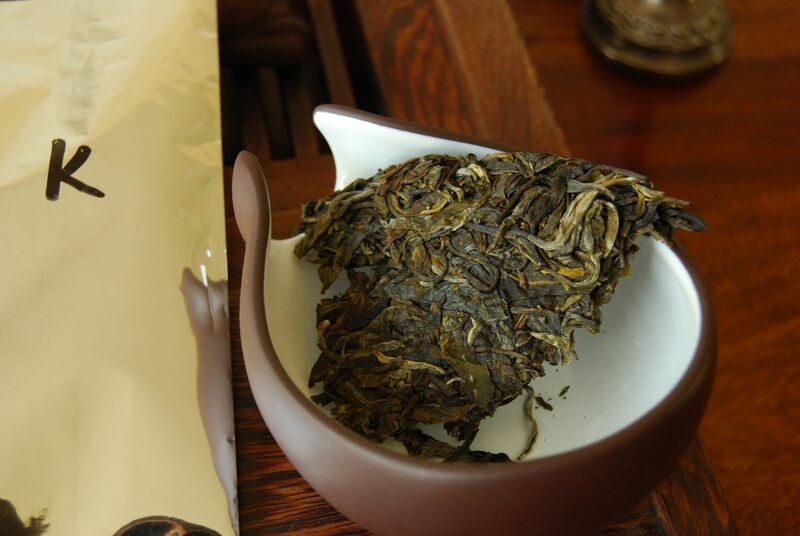 The initial Yiwu grapes of the dry leaves are present in the wenxiangbei [aroma cup], and which then translate directly into its character in the mouth. 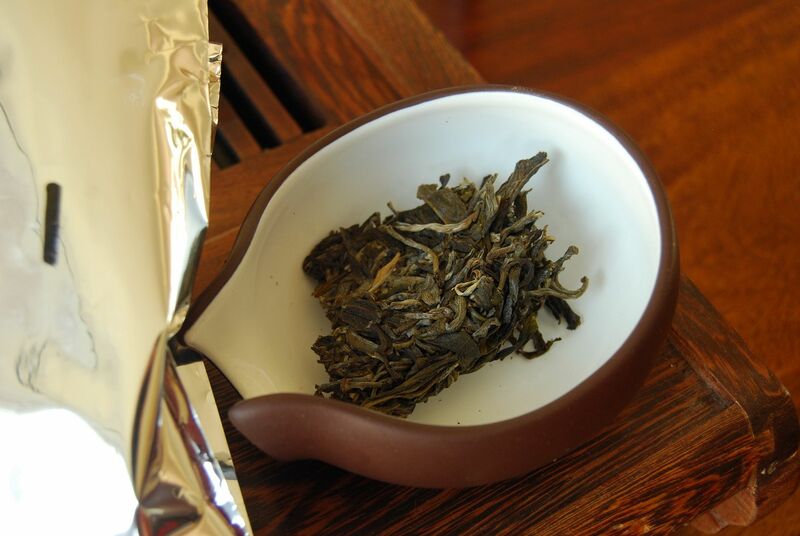 There is a solid base of Yiwu straw and a decent finish. I found it to have a decently thick body, and was vibrant in its sensation. 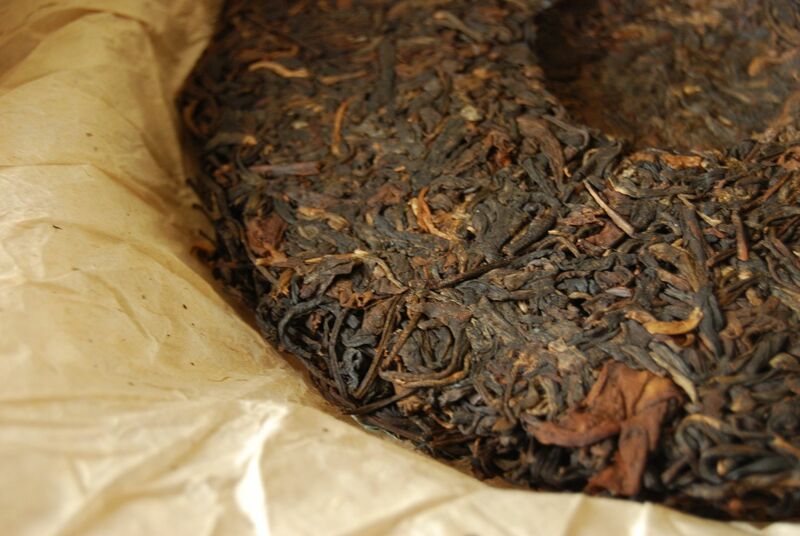 I wrote "This is good-quality, straightforward pu'ercha in the yellow-and-sweet Yiwu genre." 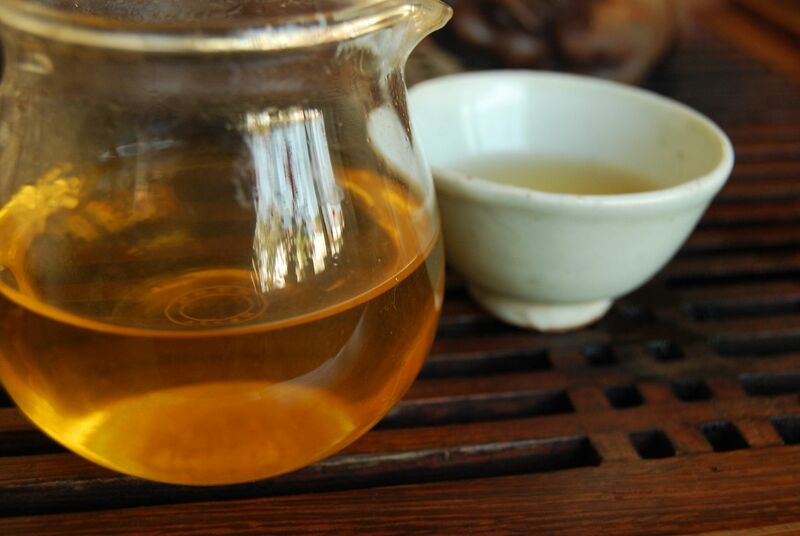 After many infusions, it settles down into a low "cough lozenge" sweetness, which is both stable and pleasant. I noted its consistency between brews. Please remember that the purpose of this tea session is not to get stressed about identifying the exact regions from which each tea derives, but rather emphasising the unprejudiced tasting that can occur when we disencumber ourselves of our expectations. 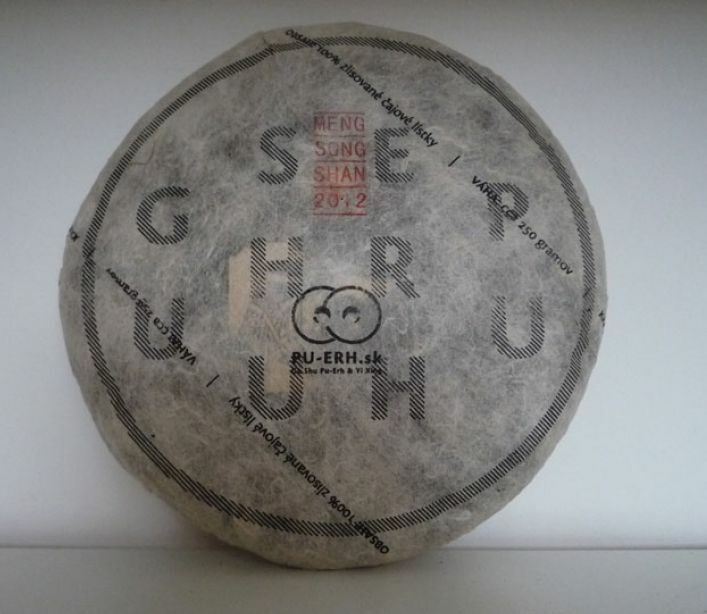 Scott revealed that this "theta" is in fact the 2013 Xiangming cake from the northern Yiwushan region, which sells for an entirely appropriate $34. 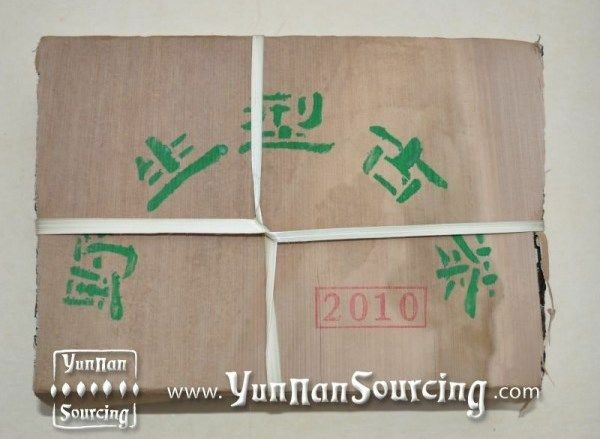 That's a good price for a solid little Yiwu cake such as this. The fact that I guessed the general region from the dry leaves left me stomping around the room thrusting my pelvis out in the celebratory stance of a tribal victor, or, at least, a bad Shakespearean actor. Tucking the pelvis back where nature intended, I was then brought savagely back down to earth by my woeful attempts to guess where "iota" originated. "These small leaves remind me of Yibang and Xikong", quoth I, like a spoon. They are small indeed, but the rinse looked suspiciously watery. 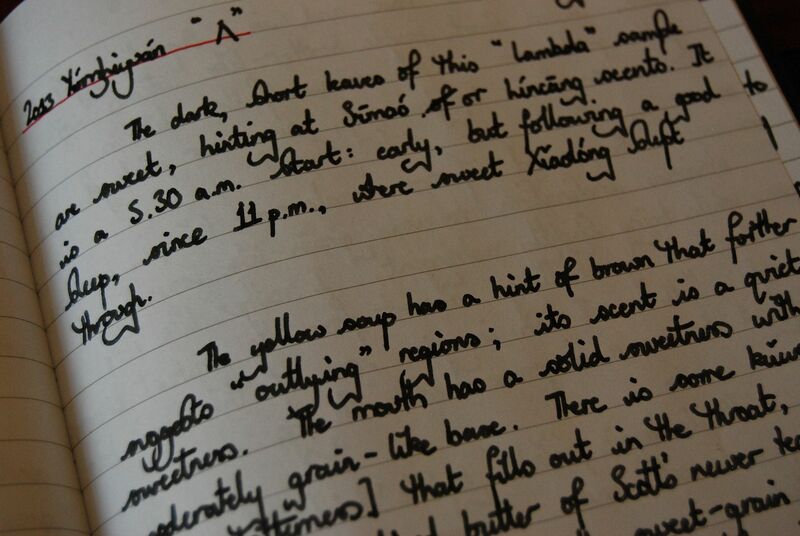 I wrote that "this is a tea that hides away": it is low and biscuit-like, with a hint of sourness. My first impressions were not favourable. There is a core of fruity sweetness that suggests some sort of "summertime flavour" region, but isn't something that I can guess immediately. It is always wise to forestall judgement, especially on the first infusion - with this reticent little tea, the second and subsequent infusions are much more open. In this case, it opened into a quite strong a and bitter pu'ercha. 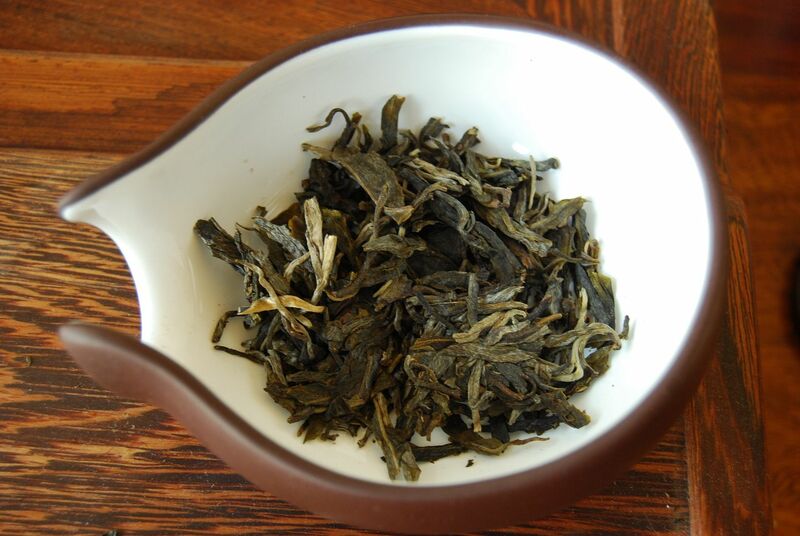 It is quite sharp and rather tart on the mouth, with the leafy-green feeling of nettles. Scott revealed that this cake was in fact (sharp in-take of breath, opens golden envelope, camera lingers on the pained-yet-hopeful expressions of various lowlife actors in the audience)... the 2013 Mangfeishan cake, from the Yongde region. Really?! Perhaps in the fruitiness. I am completely unfamiliar with Yongde tea, it seems. Hurting like a spanked schoolboy, I set aside my blubbing and turned my attention to the "kappa". Now fearful for sticking my neck out, lest I make another excrutiating Yongde-related misclassification, I merely noted that this cake was clean and fresh in its scent. The magic then started to happen. Magic, like the sorceror's apprentice kind of magic, with dancing broomsticks and pointy hats. 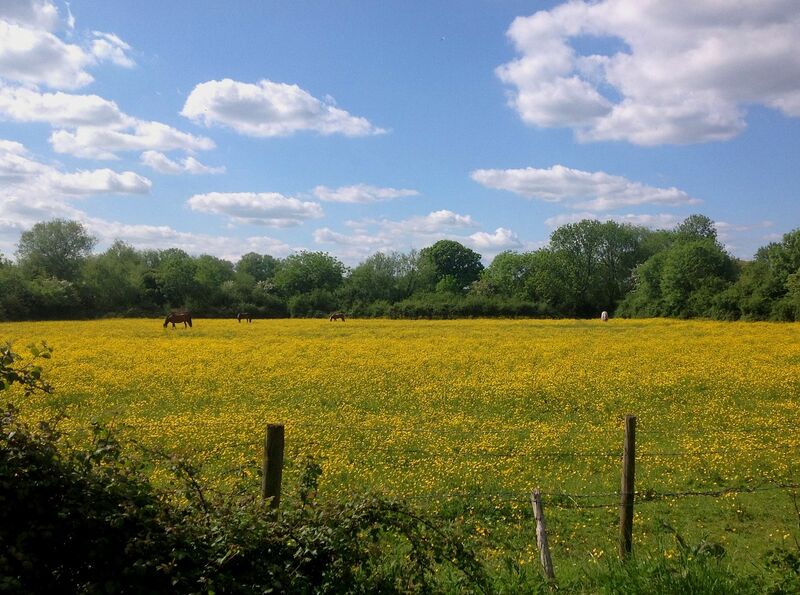 It really is rather charming. 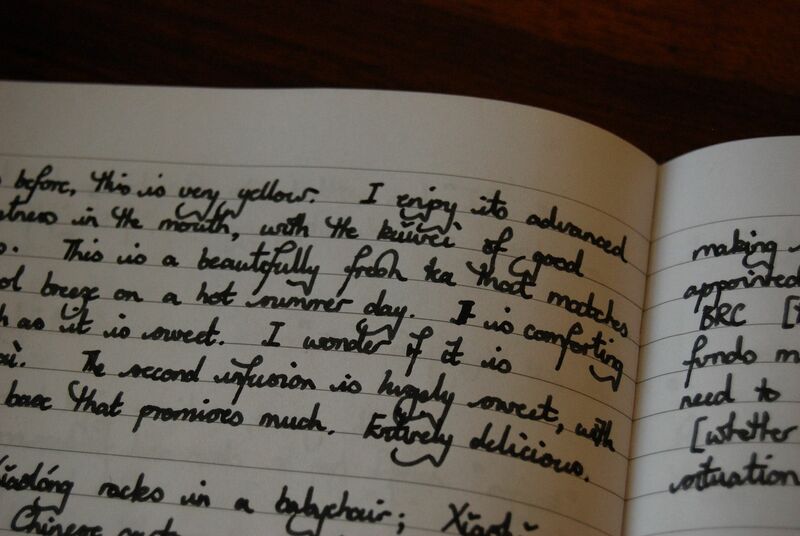 This is very yellow; the hue shown above does not really do justice to the dazzling nature of the colour of this tea. 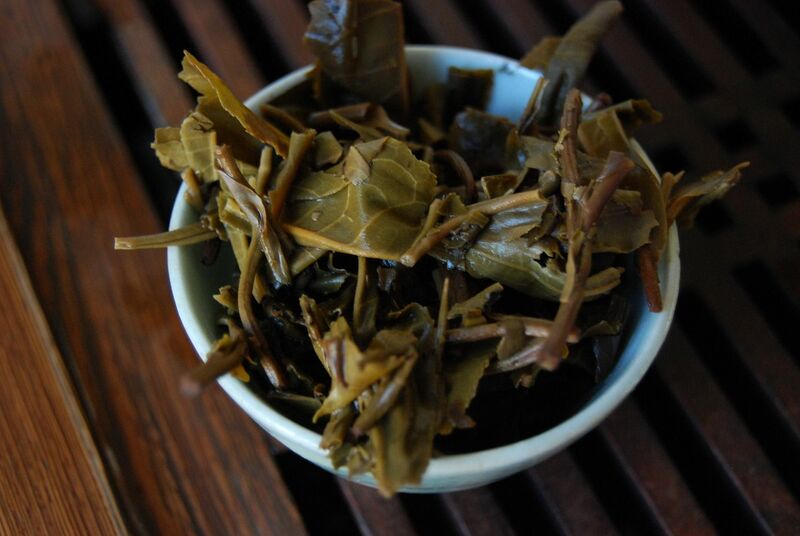 I enjoyed its advanced sweetness in the mouth, with the kuwei [good bitterness] of decent leaves. 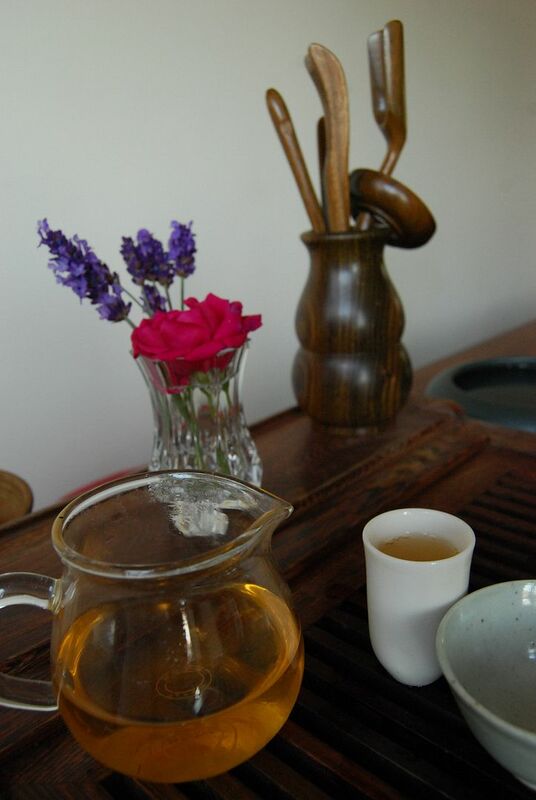 This is a beautifully fresh tea that matches the cool breeze on this hot summer's day. It is as comforting as it is sweet. The second infusion is hugely sweet, with a thick base that promises much. What is this charming beauty? 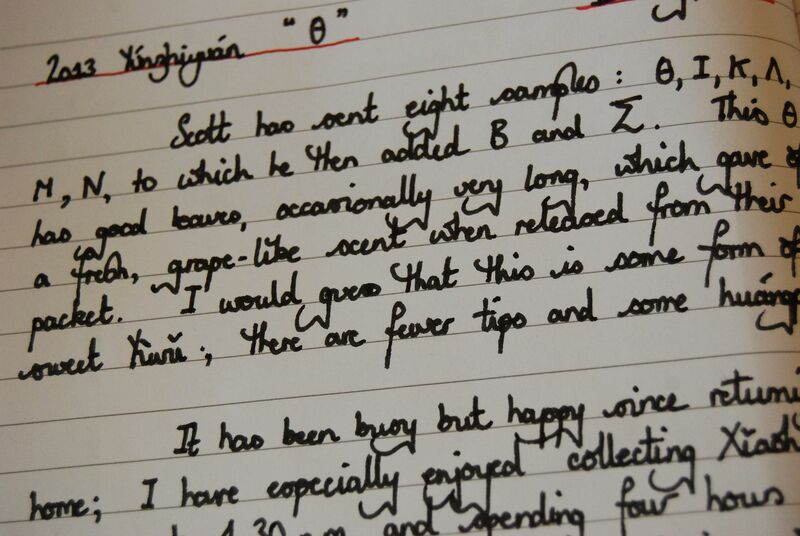 The laughter in Scott's e-mail is almost audible, as he reveals that this is the 2013 Wuliangshan cake. I am a rather vocal fan of Scott's Wuliangshan cakes, especially the 2011 version that burned through Scott's shelves so rapidly. Sensors indicate that this massively enjoyable shengpu sells for the offensively low price of $26. What can you get for twenty-six American bucks these days? A slap in the face from a lady of the night? Half a pint of rancid ale? The bargain alarm is sounding, and what a welcome racket it makes. After the "kappa", I am ready to be underwhelmed. It is a tough act to follow. "Lambda" has no such intention of letting me off so lightly. Going straight for my heartstrings, this fragmented little cake with its dark, short leaves instantly bespeak Simao or Lincang, which is, to me, like waving the red flag to the bull. The afore-mentioned deep-fried doughnut at the proverbial fatman. The comic noun to the tragic adjective-noun. Even the colour of the rinse gives this tea away, like the Adam's apple and large hands on a suspiciously well-built "lady". The hint of brown colour screams Simao. And lo: the husky grain-like sweetness was lain upon them, and in great numbers. And they protested it not. To say that this chopped-up little number is "superbad" does not really do it justice. It is packed with the caramelised butter of Scott's well-made modern cakes, and has a good filler of kuwei [bitterness] that I appreciate. It is sweet, but dominated by that husky grain that piles into the mouth like a decent Islay scotch. 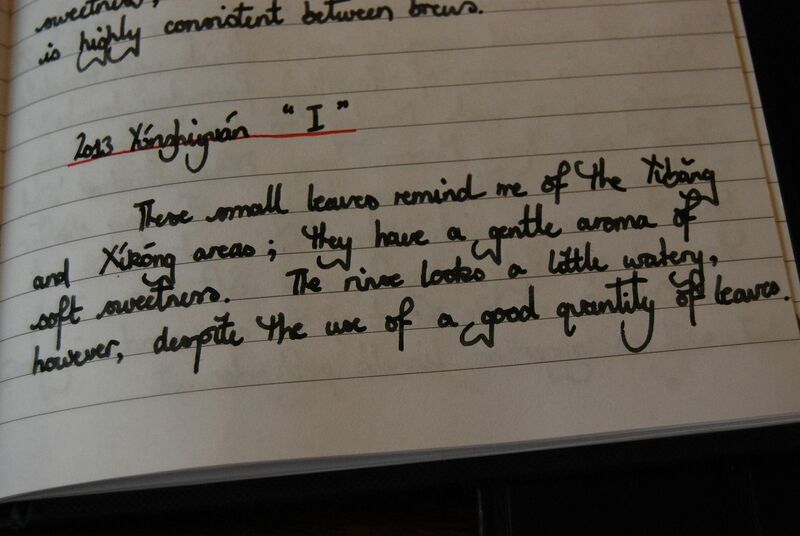 My diary has "It is reasonably thick and very drinkable - if not quite as outstanding as the 'kappa' of yesterday." I am going "all in" on this one, betting the agricultural small-holding that it is Simao right from the dry leaves, and each infusion thereafter. Scott does not disappoint, revealing that this is the 2013 Fengchun, a mysterious and new blend for 2013 made from not one but four (4!) Simao components. The pelvises, they are a-thrustin'. 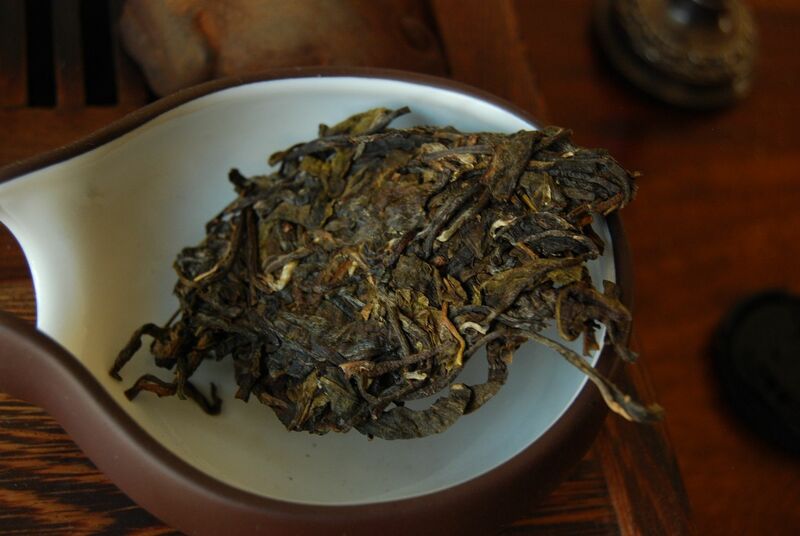 After the first four teas, then, the "kappa" stands head and shoulders above its peers, but that is because I am a complete sucker for Scott's Wuliangshan cakes. I am relieved to learn that I am nothing if not consistent. It is with great pleasure, as a result, that I hereby award the "kappa" sample the undoubted and unparalleled honour of the coveted "Space Manoeuvres" prize, which you can enjoy from the Youtube link embedded below. Over to you, hard drinkers. Lend us your opinions. 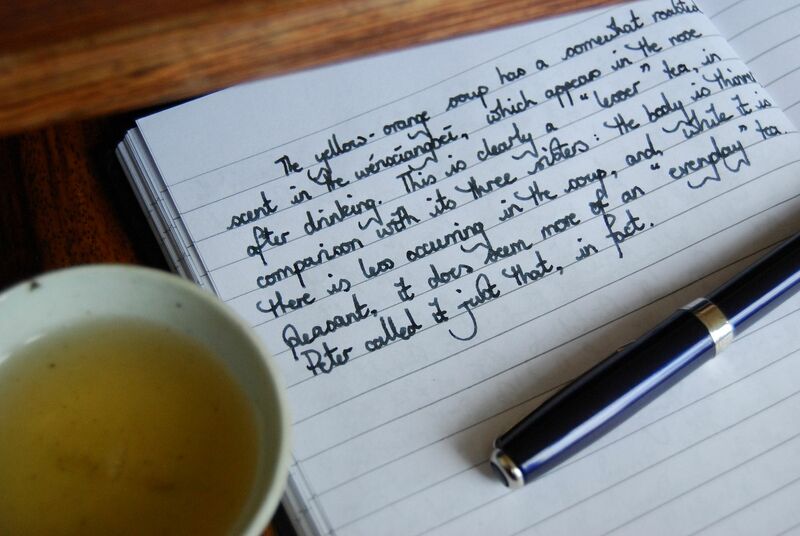 If shopping at puerh.sk has taught me anything, it's how to write "tealeaves" in Slovakian. 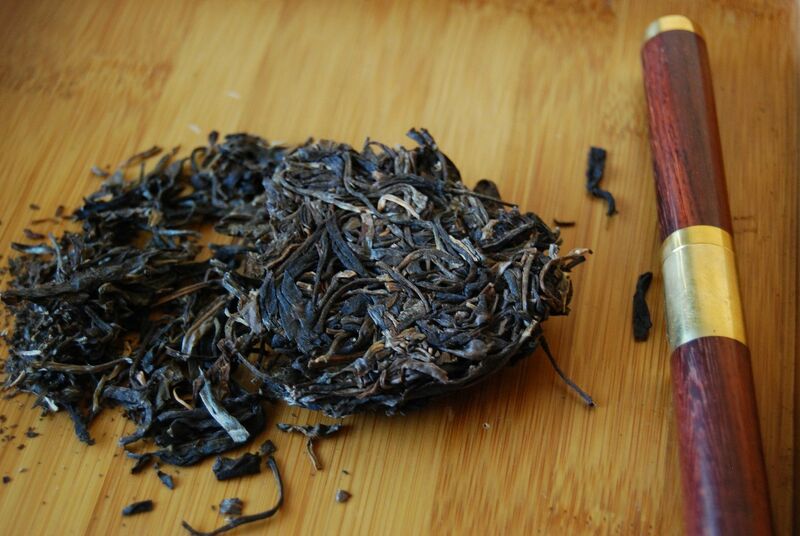 I bought a tong of the 2012 Badashan and so hope for good things. 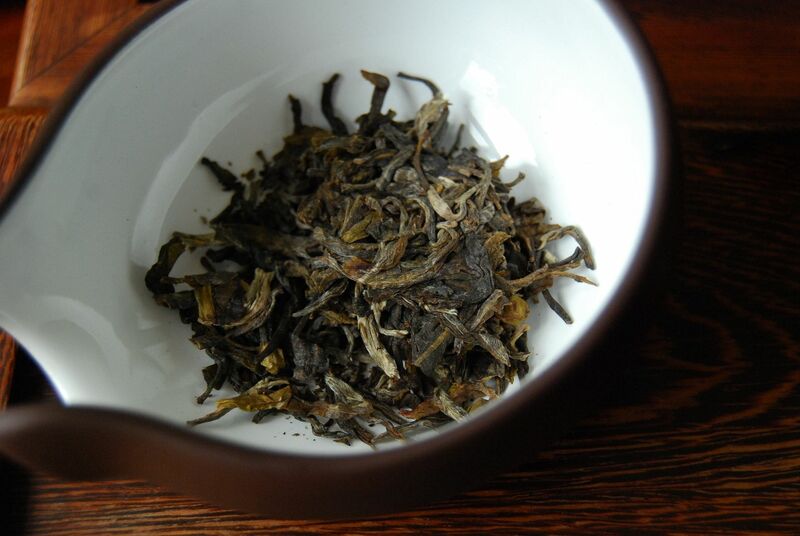 This 2012 Mengsong xiaobing sells for 20 eur / 250g. 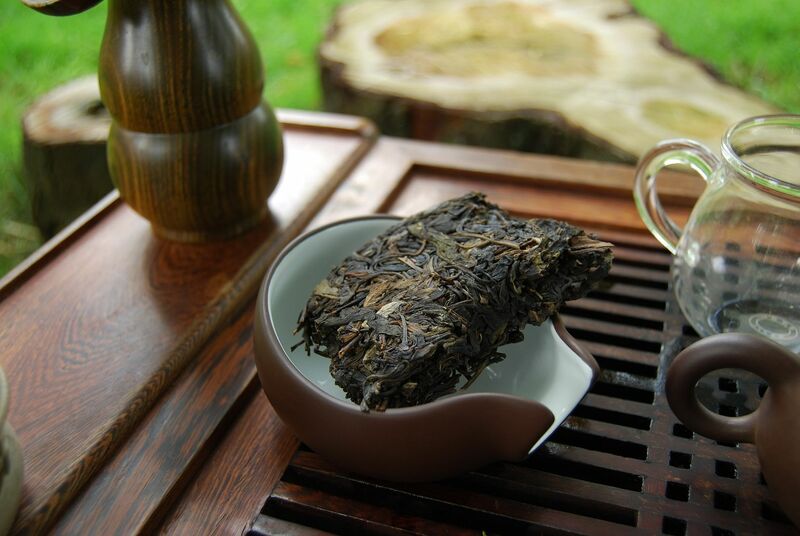 Peter notes that this is made from "60-year-old" trees rather than his usual "gushu" trees. 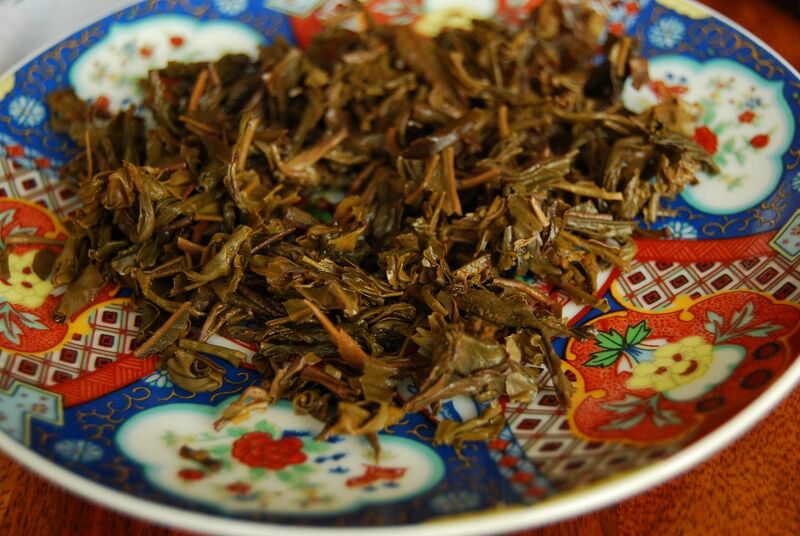 The maocha, pictured below, comprises medium-sized leaves in large fragments. It has a purely green sweetness, giving little away at this stage. 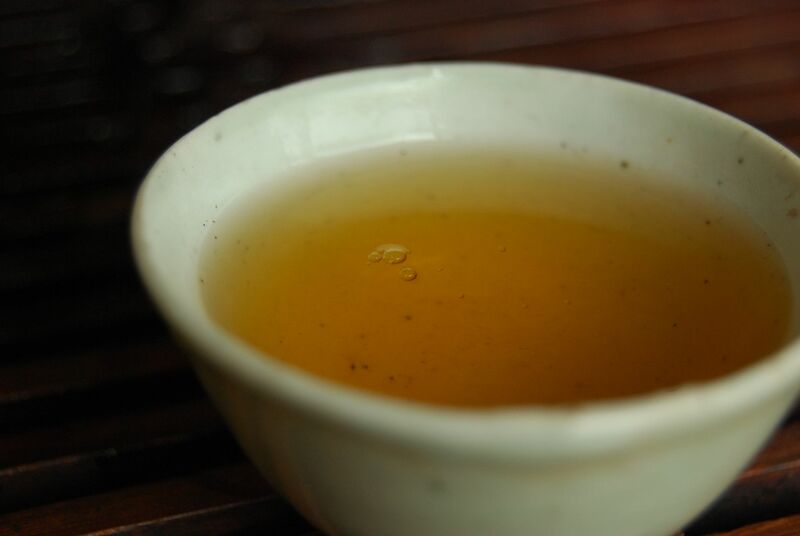 The yellow-orange soup has a somewhat roasted scent in the wenxiangbei [aroma cup], which appears in the nose after drinking. 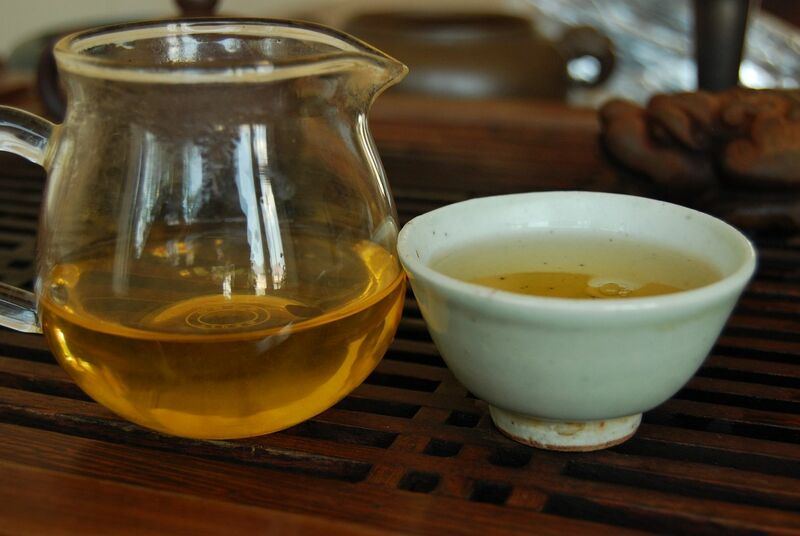 This is clearly a "lesser" tea, in comparison with its three sisters: the body is thinner, there is less occurring in the soup, and, while it is pleasant, it does seem more of an "everyday" tea. 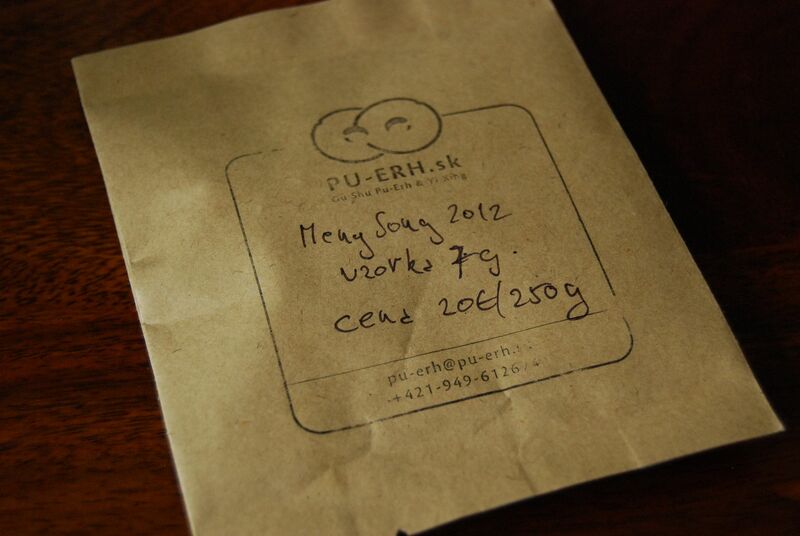 Peter [the owner of Pu-erh.sk] referred to it as just that, in fact. The leaves seem healthy enough, as shown below, but I cannot see myself pursuing this one much further. How about the 2012 Youleshan? Youleshan is the old name for what is now Jinuoshan, in Xishuangbanna. This xiaobing sells for 38 euro/250g. 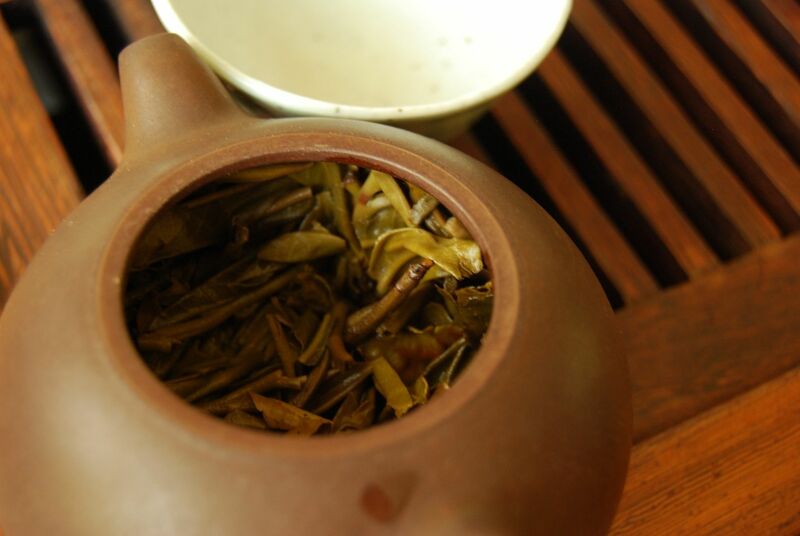 The fragmented leaves, shown above, have a low, sweet scent that can be very encouraging in a 'Banna tea. Its yellow soup, shown below, retains the low, sweet scent of the dry leaves, mixed with the pleasant butteriness of immediate youth. Likewise the character in the mouth, which is deep, tart, and sticky-sweet, with pronounced cooling. 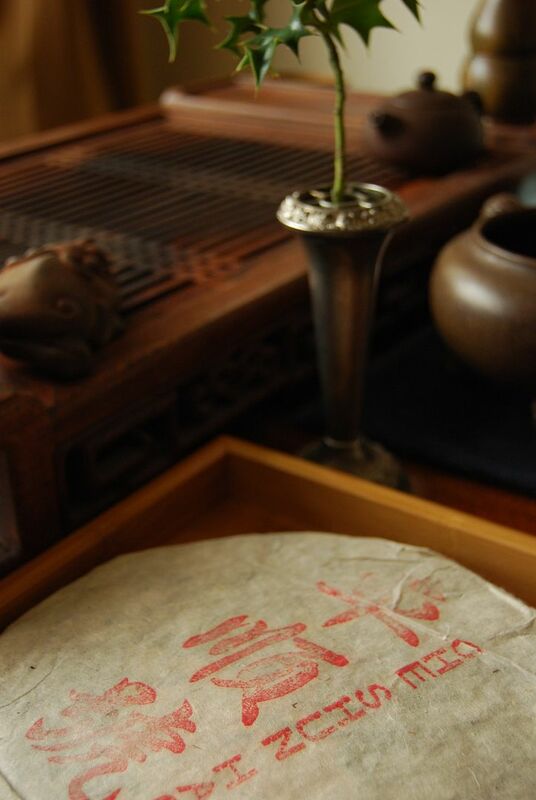 Peter wrote that the character of this tea is "somewhere between Yiwu and Banzhang", which is very perceptive: it has the sweetness of the former, with some hints of what I consider to be the grape-and-leather complexity of the latter. This is a clean and good tea; I like it a little less than the remarkable Badashan cake that I bought in quantity, but I did enjoy it very much. Later infusions develop a vivid sweetness that is most satisfying. The almost biscuit-like base is not ideal, but this contribution recedes by the fourth infusion. Not buying this cake was a close call: it was closely beaten by the 2012 Badashan and the 2012 Mannuo, both of which were rather awesome. The American notion of suction for things that are bad or displeasing is tremendously amusing to me. I think I would make a fantastic American. Apache very kindly hurled a cake of this 1995 Cheshunhao [approx. cher-shun-how] my way, and he was extremely cautious in doing so. I get the impression that he perceived this cake to be worringly damp in storage. 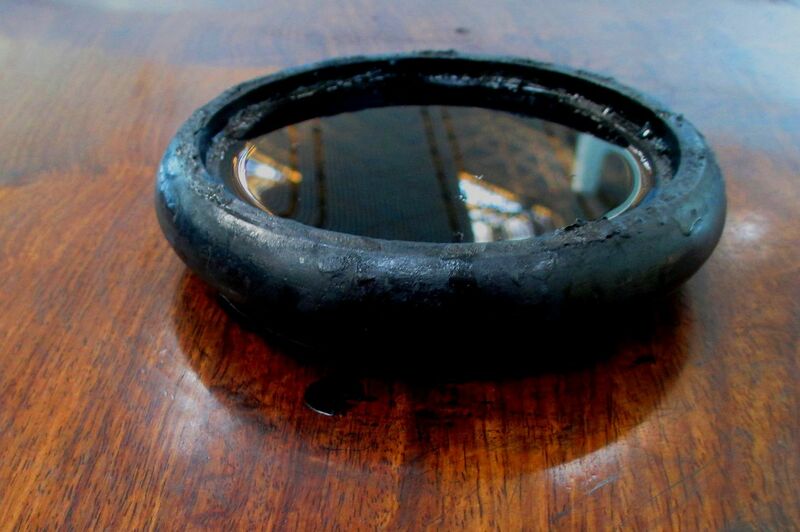 Hence, my concern about this cake's suction. 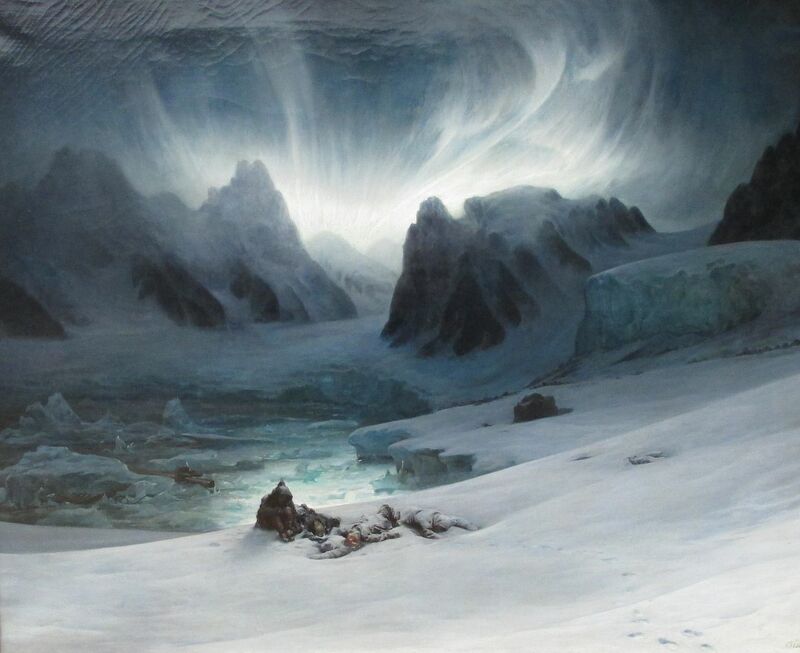 By now, you are undoubtedly thinking "this is dark". Before we get into all of that, we must make very clear that this is priced at a very humble 168 RMB (approx. £16 or $27) via Taobaowang. It looks oldish, and has absolutely no markings excepting those shown above, and so its rock-bottom price lends us pause. We therefore scale our expectations, and are in "bargain tea" evaluation mode. 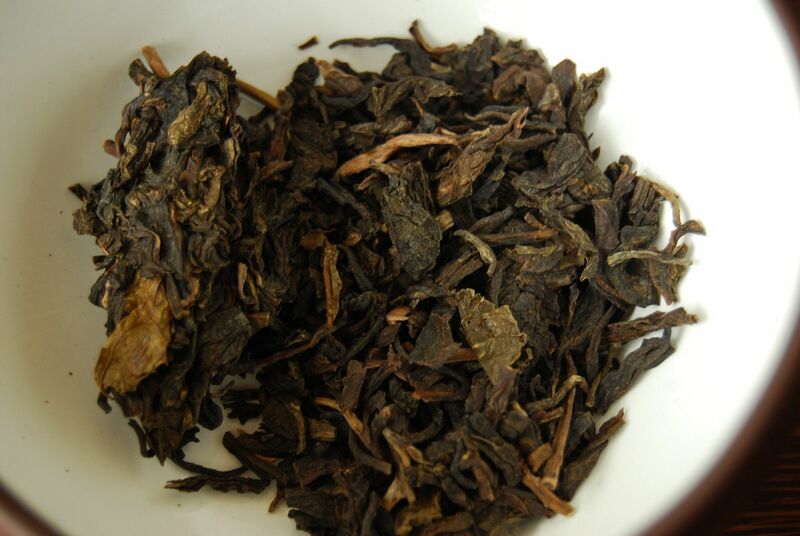 Given the humble price, you have to admit that the leaves are rather decent: as shown above and below, they are long and only somewhat fragmented, although the blend is a bit "rugged". 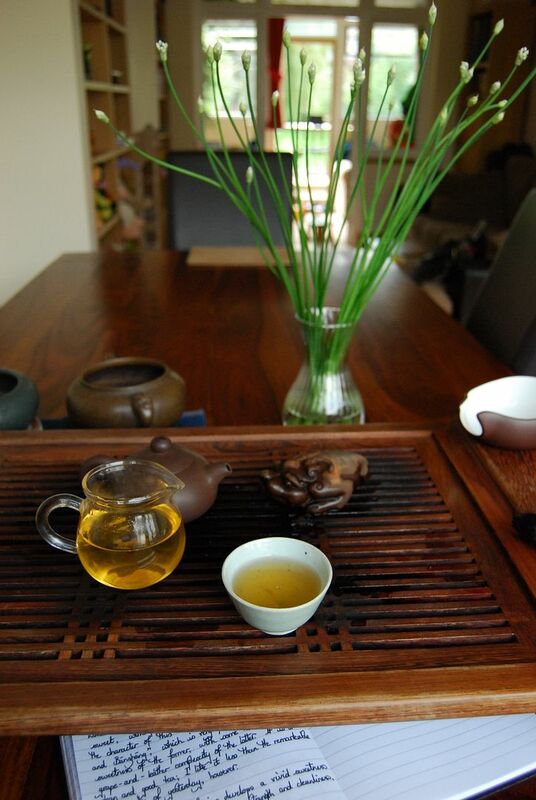 Simple sweetness and extreme cooling sensations make this a very interesting tea. The dense, heated humidity is present, but historical - in that it has aired out a great deal. The aroma that so terrified Apache does not translate into a particularly rancid feeling in the mouth. It is undeniably good for around £17. 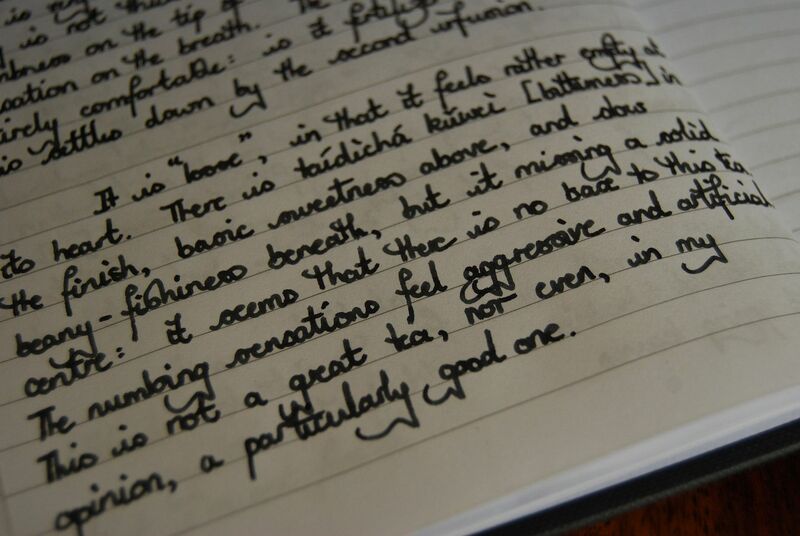 I found it comforting, and, my journal notes, "a fine tea for writing; an undemanding companion." Teas like this are never going to be the subject of a careful tea session. 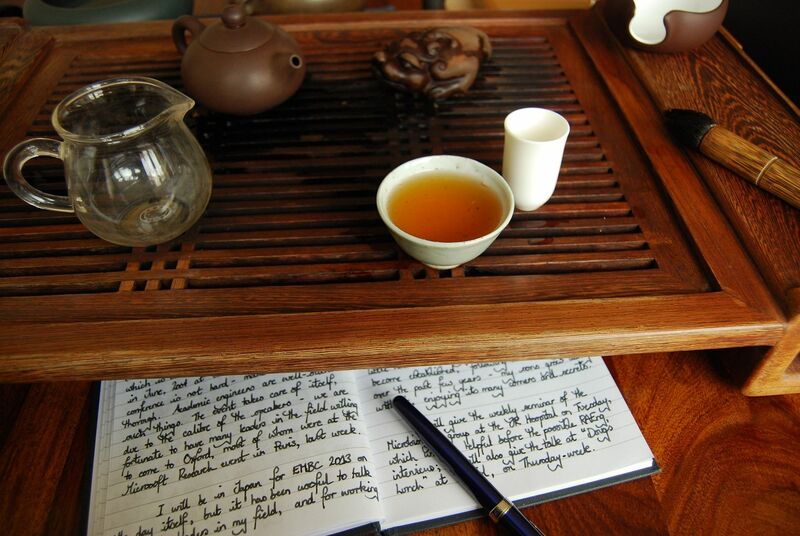 If you have time to sit at the table and dwell, the time is best spent with real tea. However, for casual sloshing around in my lab, this combines a surprising amount of caffeine and continuous, unchanging sweetness with its undemanding nature. It's thin, it's a bit boring after half-a-dozen infusions, but it is only £17 for something that is probably at least 10 years old. I then come to the part of my drinking process in which I try to imagine if I "need" this tea. Looking at my "potential suction" regions of our tea-shelves, which usually form the basis for exporting to the lab, I don't imagine that I will be buying any of this. One cake is more than enough for me, given that I have plenty of fodder to get me through my working week. However, while unlikely to impinge greatly on my shelves, if you're looking for a lo-fi, no-frills, undemanding return on the investment of a meagre 168 RMB, you can't really go wrong. The combination of humble price and decent return reminded me of the modus operandi of twodog2, but I can't find his writing on this cake after much time spent trying. Programmers: how about a Google Scholar equivalent for tea? 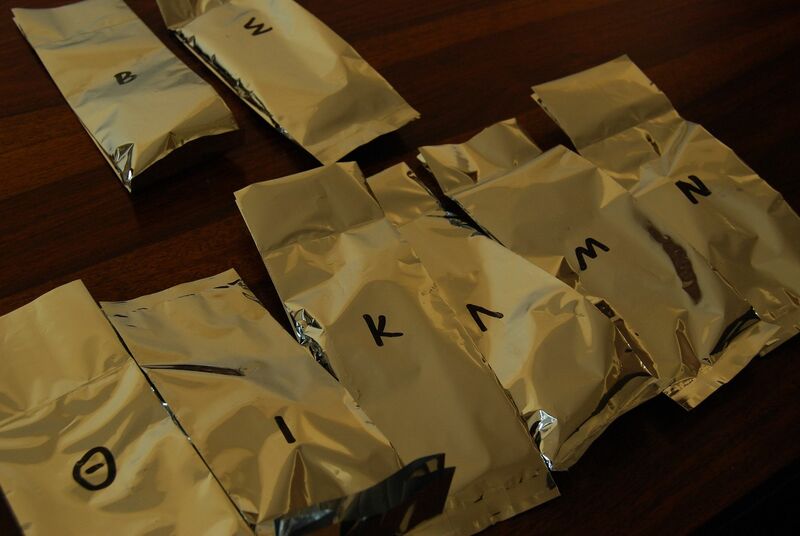 Hopefully, your various samples have arrived! They have been labeled with (upper-case) Greek letters. For next Friday (i.e., 26 July), I'd like to discuss "theta" (circle-with-horizontal-line-through), "iota" ("I"), "kappa" ("K"), and "lambda" (an upside-down "V"). Hopefully, you'll be able to join us in the "comments" section to discuss your findings. If you cannot find the time to get those samples tried for Friday: fear not. Just enjoy them in your own time. Perhaps the Friday afterwards (i.e., 2 August), we will discuss the four remaining samples: mu ("M"), nu ("N") and then the two that Scott kindly added: beta ("B") and sigma (rotated "W"). 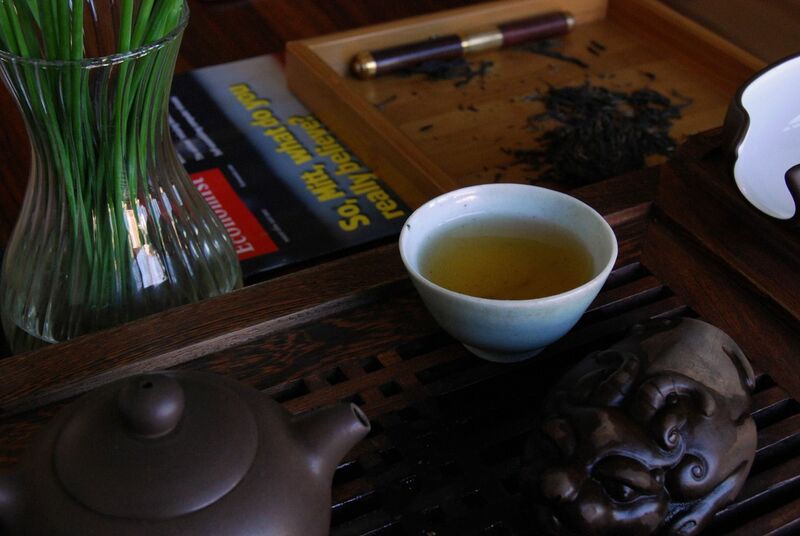 In August, we'll move onto the China Chadao tasting event. 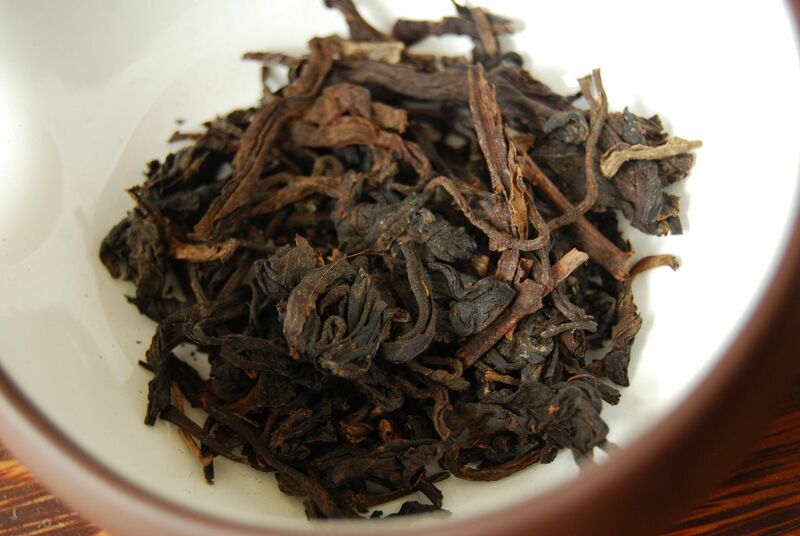 Long have I been affectionate of the 2006 Liming "Tuowang", which I failed to buy back when it was produced. 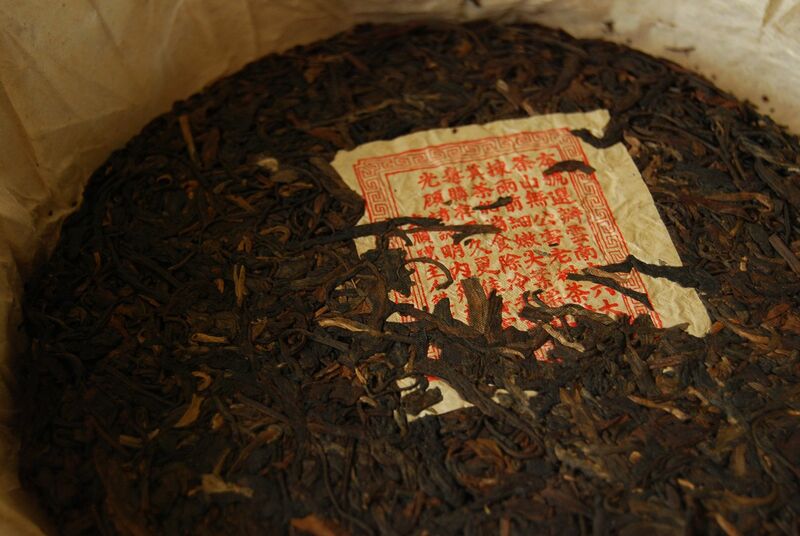 Now reunited, due to a very decent price at Royal Puer, I invited you to join us at the original page for this tuocha and track its considerable development. Up until today, I was under the impression that Dayi cakes were, at least, fairly good. Most are, to my tastes, really rather satisfying. Every now and again, there is a duffer (e.g., 0622), but never anything that I could actually describe as bad. Ladies and gentlespoons, I give you the 2009 Dayi "69th Anniversary" cake. It is not possible to discern the magnitude of this cake's suction from the wrapper, which looks innocuous. By the time we turn out the dry leaves, we encounter a fragmented mess - but this is Dayi, after all. 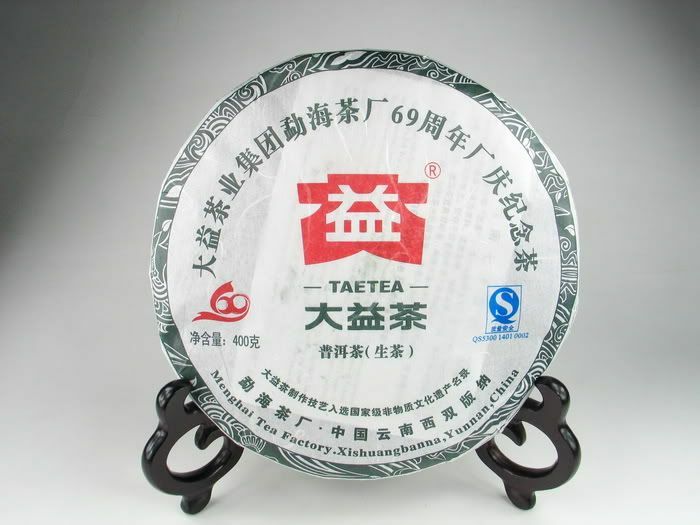 With its inclusion of huangpian [yellow flakes], it looks a little like the 70th anniversary cake from 2010. However, this is where the similarity to Dayi cakes begins and ends. The soup turns out a little orange (pictured below), in correspondence with the fraction of red leaves that may be found in the maocha. 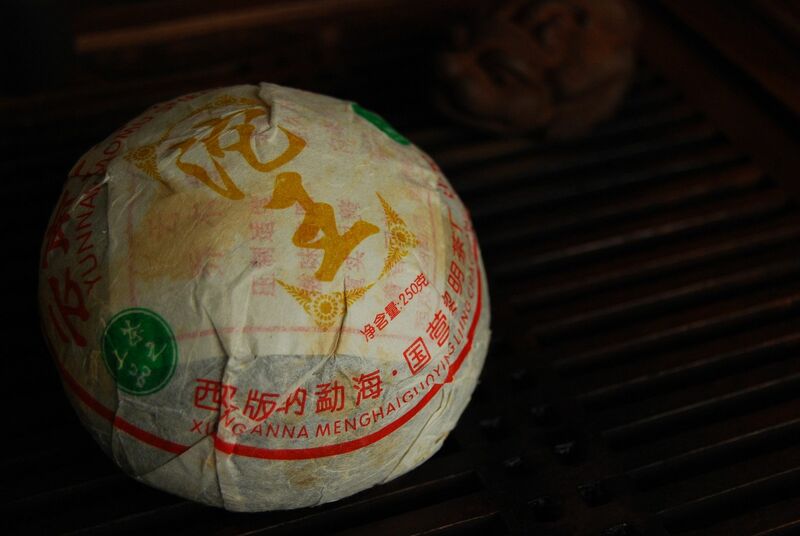 The scent is a little fishy, in the manner of Japanese greens, but there are several Menghai Tea Factory cakes that have this characteristic - some old. This tea has the worryingly obvious characteristic of artificial agents at work in the mouth. 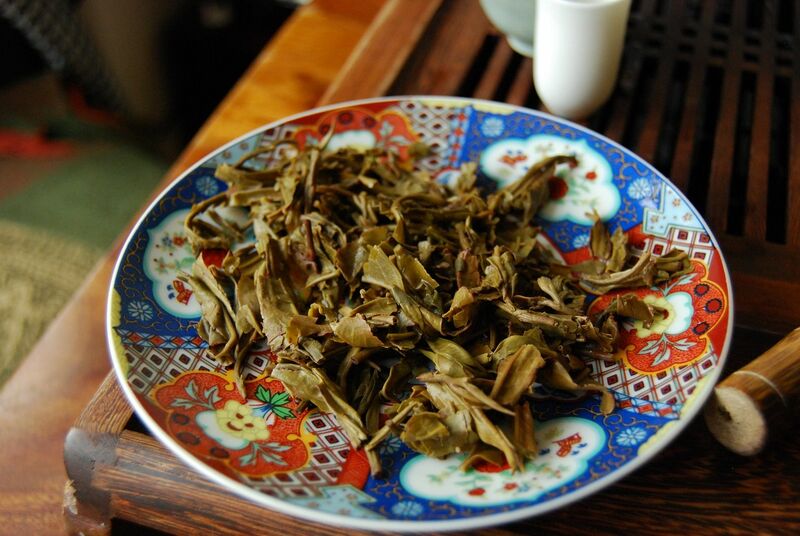 The tongue and roof of the mouth are numbed, but not in the pleasant manner of gushu leaves; clearly, for the low price (currently approx. $60) this is taidicha. No, this numbness is aggressive, cloying, and very concerning. Pesticide, fertiliser - I know not what, but it is absolutely antagonising. It is a "loose" tea, in that it feels rather empty in its heart. 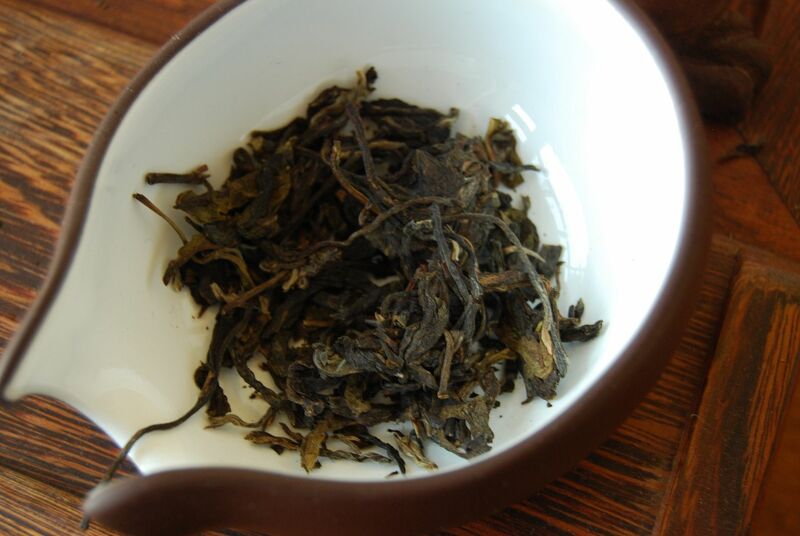 There is taidicha kuwei [plantation bitterness] in the finish, a basic sweetness above, and slow characteristics of fishy-beaniness below - but it is missing a solid centre. It seems that there is no base to this tea. The numbing sensations feel aggressive, and artificial. This is not a great tea, nor even, in my opinion, a particularly good one. I abandon this cake after just a few infusions, marvelling at the very existence of a Dayi cake that I genuinely dislike. 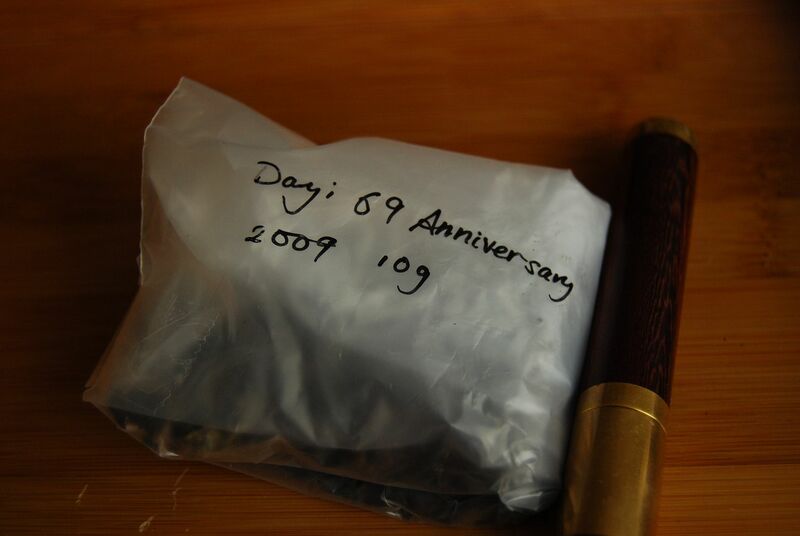 This was sold by Dragon Teahouse, and so I have no reason to suspect that it is a fake, leading me to conclude that Dayi simply dropped the ball when it came to their 69th anniversary.